It had been a long and difficult mission—long enough and tiring enough for SFC Robert Piper to grab some sleep in the back of his team’s truck rather than ride in the usual shotgun slot in front. Piper was sound asleep when the IED went off, lifting the front end of the truck nearly ten feet into the air while a hail of makeshift shrapnel killed the driver and the SPEC-4 who’d taken Piper’s seat. When the bomb went off, Piper was having a pleasant dream about home and Lisa, the woman he’d loved since they’d first met in High School. He’d found a spot at the very back of the truck that had enough room for his six foot four inch frame to sprawl out. That meant that when the front of the truck lifted into the air, Piper was dropped—quite rudely—into the middle of a deadly ambush. “What the hell!” He bellowed as he smashed into the hot asphalt of the roadway, barely conscious of the truck cartwheeling away from him. He bounced and slid, still cursing, until his body slammed into the berm of hard packed sand that formed the edge of the roadbed. Instantly he found himself under fire. Insurgents with an IED got the truck! He realized as, now fully awake, he rolled away from the bullets impacting the asphalt all around him. Just as his truck bounced one last time before striking the berm on the opposite side of the road. It punched halfway through before sliding to a halt in a more or less upright position. Its front end, he noted, was mangled beyond recognition. Piper popped up over the berm long enough to have a look around before being forced duck back down by a new flurry of gunfire. Those’ve gotta be the ragheads who set off the IED, he groped around for his rifle—but found that the lanyard designed to secure it to his body armor had been shredded at some point in his travels. Great! He drew his handgun and jacked a round into the chamber. Now where are those…? He ducked low and tried to push himself under the sand as another flurry of gunfire came from above. He could feel the bullets slam into the sand around him. This is not good, he thought, eyeing the rise that ran alongside the road. They’ve got the high ground and automatic weapons! I have… He looked at his Browning. This! Gianelli! The RTO still had the radio strapped to his back—but he wasn’t trying to use it—he wasn’t trying to do anything more than fight his way clear of the truck. He looks dazed, Piper thought. I don’t think he’s really aware of what’s going on—instinct is pushing him toward the light. Piper’s eyes widened with shock when Gianelli, using his right hand only, pushed his chest and head free of the truck—and rolled forward and out—revealing what was left of him. God! Piper’s eyes widened. His left arm is completely gone! Piper stared at the man. It must have been sheared off by the blast. He watched as Gianelli struggled to be free of the truck. He’s bleeding pretty badly—it’s a miracle he’s still alive! A moment later, Gianelli half-jumped, half-fell from the back of the truck and into the sand below. He pushed himself upright, barely able to stand, before staggering unsteadily away from the wreck. He heard a bullet spang off Gianelli’s body armor; another hit him in left leg. Gianelli cried out mindlessly and fell to the ground. He tried to get back on his feet, tried to crawl forward—and found he couldn’t move. Crying, he gave up; rolling himself into a fetal position, arm in front of his eyes as he tried to hide. Piper shook his head in disbelief and horror. The man had barely managed to clear the remains of the truck before he had been—quite literally—shot to pieces. I might have saved him if I had been able to give him cover fire; Piper looked at the unmoving body of the youngster who had served with him for months. But with my rifle gone, I couldn’t even do that! He shook his head and took a moment to check the load on his Browning. I can’t do much for myself, either. Then he realized that the squad radio—the PRC-117F—was still strapped to the dead man’s back. More gunfire sounded from the hillside above. The insurgents had apparently decided that Piper couldn’t escape from his position so, having seen Gianelli crawl out of the truck, they’d decided it would be smart to make sure there were no other survivors. He waited until the fire slowed. And made a full-speed dash for the truck. The sudden and unexpected move took the gunmen on the ridge by surprise. It took nearly three full seconds for them to react—more than enough time for Piper to slide behind the tires on the right hand side of the truck. They did—the insurgents kept firing at full automatic, spraying and praying that they’d get a hit. Firing his pistol blindly toward the men on the hill (hoping to keep their heads down), Piper scrambled out from behind the tires and grabbed the webbing that held the radio on Gianelli’s back. He didn’t intend—and had no time—to undo the buckles and snaps that held it in place. Instead, he emptied what was left of his magazine in the insurgents’ direction and dragged the RTO’s body back behind the cover of the big tire. The top of the ridge suddenly exploded in smoke, flame, and dust. And saw four insurgents—each armed with an AK-47—approaching from his right. I guess they got bored! He realized. And realized that I wasn’t going to give them a clear shot He flicked the safety off the Browning. So they decided to try to flank me! He dropped the pistol’s sights onto the closest man’s chest. Wish I had a rifle…  And squeezed the trigger. The target jolted to a stop so suddenly he might have run into a wall, and then crumpled to the ground in a heap. He fired again—and the second man dropped in his tracks, blood spurting from his forehead. One of the two survivors began shouting orders and broke to one side. Thunder sounded in the sky behind him as the drone made a second run, this time firing a minigun that Piper could see was in a weapons pod slung beneath a wing. A moment later, the Predator banked and made a long strafing run along the ridge line, scattering bloody bits of insurgent in all directions. The Medevac chopper didn’t wait to pick up the bodies of Piper’s men—a truck from graves registration was already on the way to take care of that unhappy chore and the pilot had orders to fly Piper directly to Camp Freedom for a meeting with higher command—and the pilot had enough experience not to keep the brass waiting. 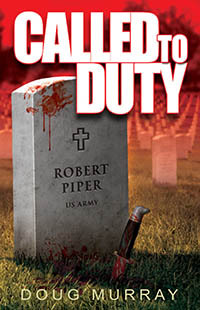 “You’re Piper?” The man who met him at the helicopter door was short and wiry; with hair long enough to mark him as a civilian despite the cammo fatigues identical to Piper’s—albeit fatigues that were clean and sans insignia of any kind. Piper nodded and climbed out of the Humvee—which pulled away the instant he slammed the door closed. I’m not supposed to talk about Drones with chain guns, he nodded to himself. Okay, OK—Farrell saved my life so I owe it to him to play along. He watched the Humvee turn toward the far side of the base. But I’ll expect a hell of an explanation when we have that drink! He stretched, checked his uniform, and headed for the headquarters door, automatically straightening his shoulders as he went. And Mr. Farrell is definitely the one who’ll be doing the buying! Farrell did buy—but not at the NCO club that Piper frequented. Instead, the shorter man drove them to a very well-appointed bar on the far side of the base where a pretty girl took their order. He squeezed the trigger and watched the man fall—revealing a second man just behind. “How many did you end up shooting before the drones got there?” Farrell asked as he poured a single-malt scotch later that evening. “Don’t laugh. Those guys—-the ones out there,” he gestured to the Afghan mountains visible through the O-Club windows. “Might be a problem right now but you know we’re going to handle them when we get serious it. The guys with the computers, though. They’re going to be the next big problem. Farrell glanced at the monitor that showed the various video feeds he had managed to get on line. The crowd outside the residence they’d chosen for the meeting was certainly growing larger—and he could see raised fists and yelling faces. There was an explosion just before the line went dead. Farrell bit his lip as the line went quiet. On the surveillance screen, he could see more and more activity around the Mission. The crowd now numbered in the hundreds and he could see the flash of weapons coming from far too many places in that crowd. “Higher headquarters will decide what to do—is that clear?” The voice came back. “Roger.” Farrell kept a lid on his temper and did not slam the phone into its cradle as he wanted. Instead, he carefully lowered it as he watched the action in front of the Mission heat up. Looks like there are a couple of hundred rioters out there, he thought. And Piper’s got—what—four effectives? He glared at the phone. Higher headquarters better make up their minds pretty damn quick or I’ll… Farrell hesitated. What could he do? He only had ten reliable fighters in the Annex. Even if he got all of them into the fight right now, what good could they do? Crap! Piper flinched as a mortar round hit the interior courtyard of the building the CIA had chosen for their meeting. A few more hits like that and the walls will come down! He was scanning the crowd, looking for leaders, assessing threats. Most of the men he could see were just milling around, angered by something they had heard in the Mosque, but not willing to spill blood over it. Others, however, the ones Piper was really searching for—were far more focused. There’s one, Piper put the aiming dot of his M-4 on the forehead of a man holding an AK-47 and haranguing a group near the left edge of the crowd. He’s herding the mob in our direction. Piper thought as he stroked the trigger, keeping his optics on the man long enough to watch the round impact just behind his target’s left eye, caving in that side of his skull. Okay, that’s one down. He kept scanning, his gaze moving slowly from left to right. Who’s my next customer…? Another mortar round struck—this one deeper in the courtyard. Piper ducked down as bits of rock hit his back. They’ve gotten inside the compound, Piper realized. If they get to the gates and open them, the rest will come in. If that happens we’re cooked! He came to a quick decision. I’ve got to stop them! He moved toward Blanchard’s position as he flipped his M-4 to ‘Automatic’ and began hosing the interlopers. Even as he spoke, more men came over the wall, all of them carrying automatic rifles of one sort or another. Another mortar round impacted in the courtyard, sending shrapnel zipping through the little compound. Piper winced as a red-hot piece bit into his calf. The courtyard was filled with rioters now--far too many for to stop with or without air cover. Piper disengaged and began looking for a way out. If he could reach the main house—he might be able to fort up until help came. If it ever does! “Crap!” Farrell cursed as he saw Piper go down—overwhelmed by the sheer number of attackers. Others were already smashing their way into the residence. “Higher Headquarters has ordered all units to stand down.” The answer came. He slammed the phone down into the cradle, cracking the hard plastic with the force of his rage.